Once upon a time, a few ladies gathered on the east coast to toast a friend’s ending bachelorette-hood. Through the course of the weekend, this group of 6-8 ladies might have eaten a 3 gallon tub of cookies. To make us feel better, we renamed the cookies and called them “granola bars.” In our defense, there were some oatmeal raisin cookies in there, which are practically granola bars! A year later, four ladies reconvened to toast no occasion with lots of moscato. I served as host and responsibly made 4 dozen of the most addicting chocolate chip “granola bars” to last us the weekend (more on those another time). For breakfast though, I thought maybe we should have something a little healthier. In my mind, there was a dozen pumpkin muffins in the freezer. In my freezer, there were no muffins. With my first guest 2 hours out and my kitchen newly cleaned, I scoured my resources to figure out what sort of breakfast item I could whip up to please the ladies with only the ingredients in the house and without using every appliance I own. Fortunately, I had bought everything to try a new recipe the week before, but hadn’t gotten around to it. Sometimes procrastination works in my favor. 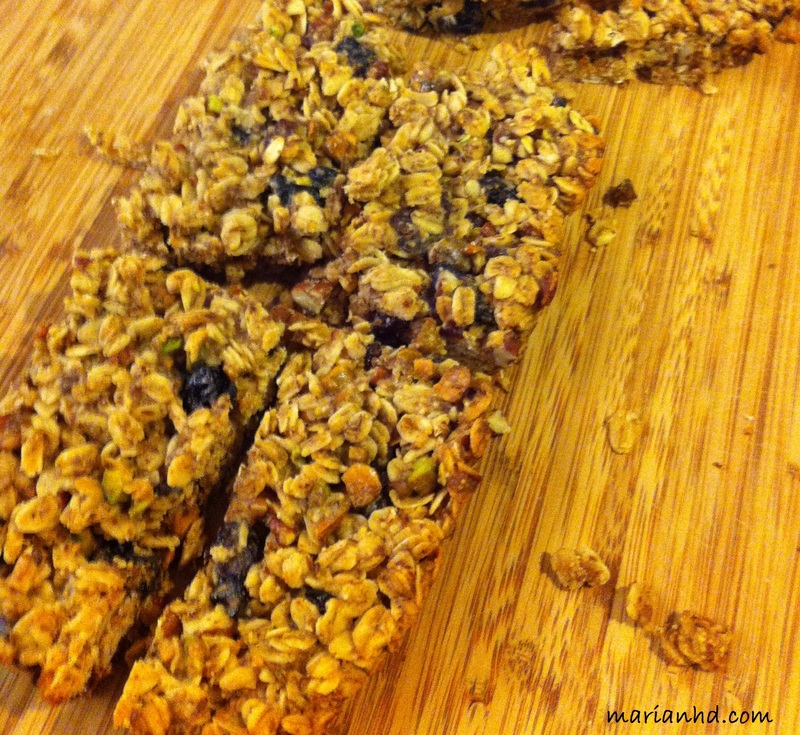 In my goal to reduce our reliance on convenience foods, I had been wanting to try to make granola bars at home. 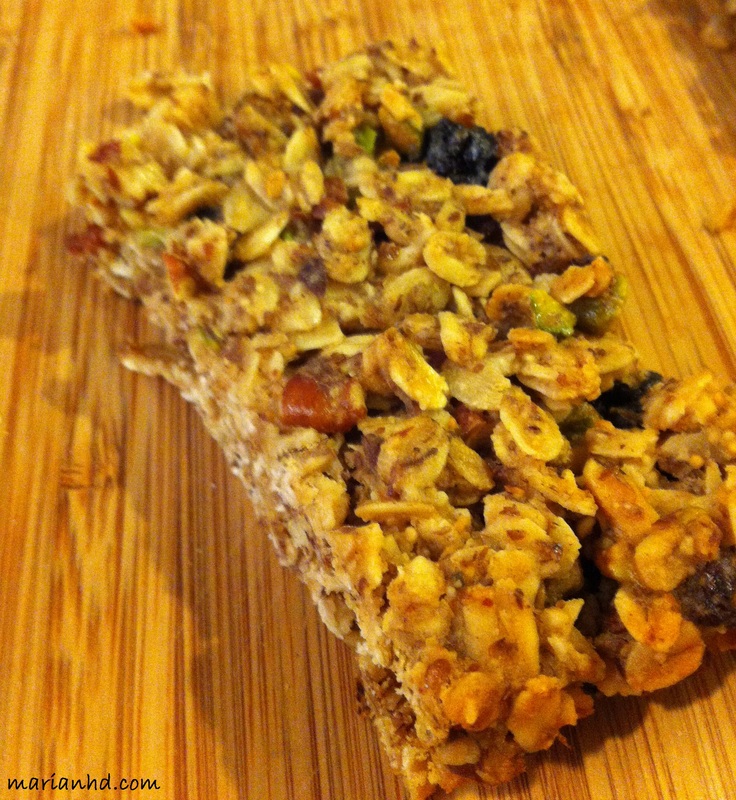 Real granola bars. I liked this recipe because the ingredient list was relatively short and easily understood. Except for one ingredient–spelt flakes. I searched high and low for spelt flakes. In my world, if Whole Foods doesn’t have it, I give up. So I did. And in the bulk aisle of Whole Foods I Googled “spelt flake substitute.” Wouldn’t you know it, whole oats would work fine. That made this recipe way easier! 1. Preheat the oven to 325 degrees. Prepare your 8 x 8 in pan. 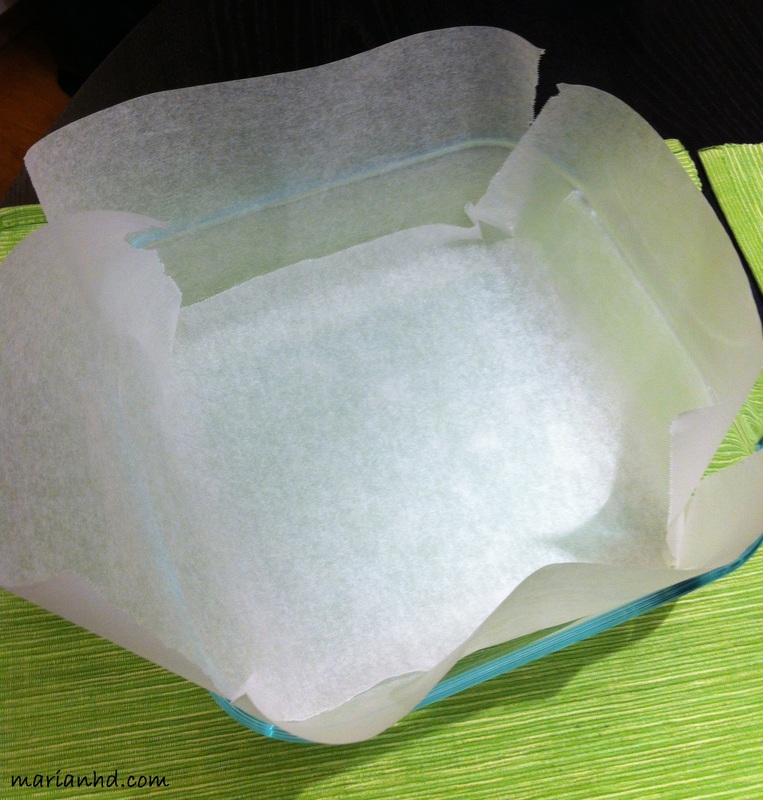 Brush the pan with walnut oil, line with parchment paper with excess paper hanging over the edges. See photo. Brush the paper with oil, too. (I put a little oil between the sheets of parchment paper to keep it from moving while I mixed up the bars). 2. 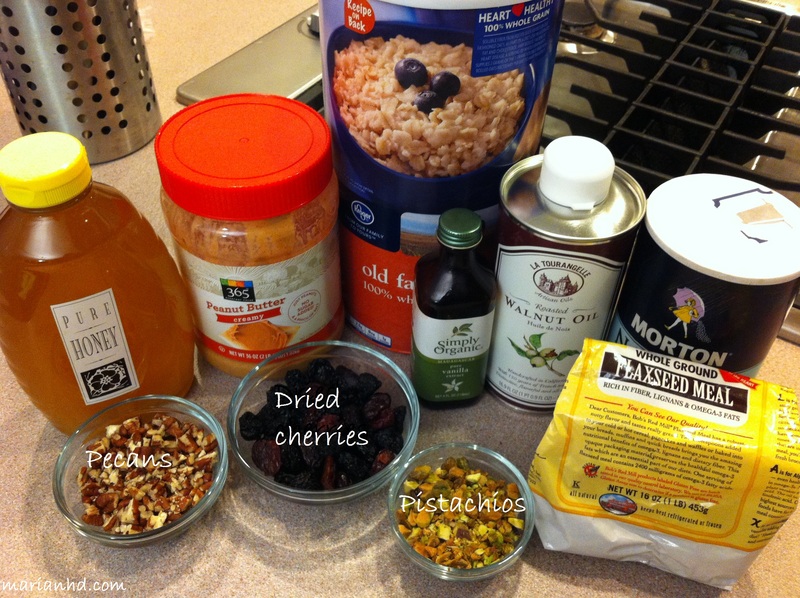 In a bowl, combine oats, cherries, flaxseeds, pecans, pistachios, and salt. 3. In a small saucepan, combine the honey, peanut butter, 1 tablespoon of walnut oil, and vanilla extract. Heat and stir until everything is melted together. Add to the dry ingredients and stir to combine. 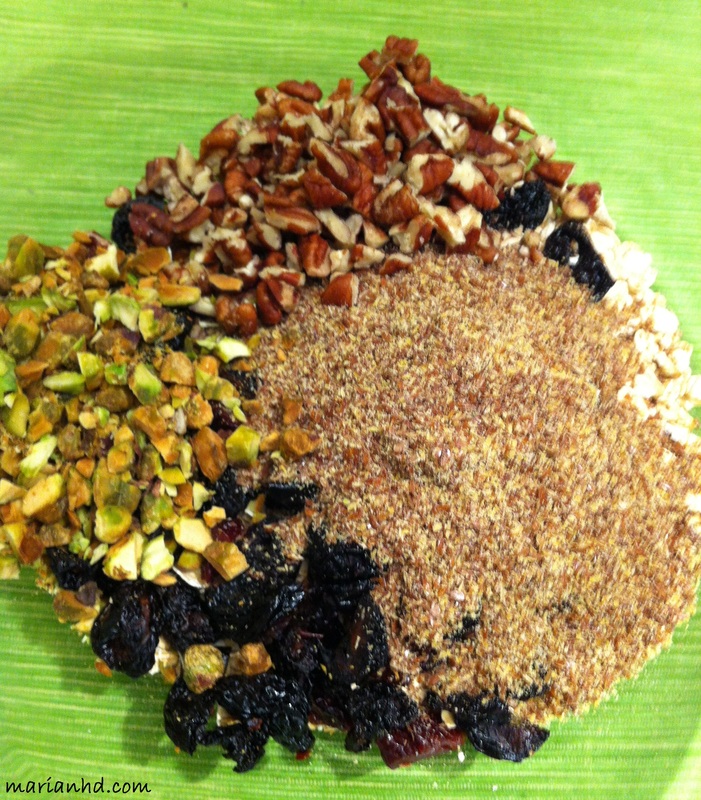 Dump the mixture into the prepared pan and press it down evenly.